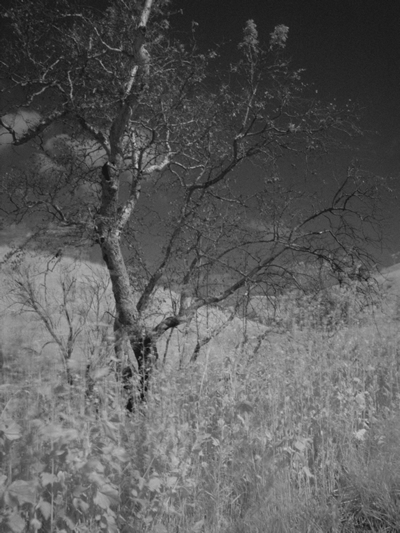 One of the more interesting assignments we were given this semester was to turn in an infrared assignment. 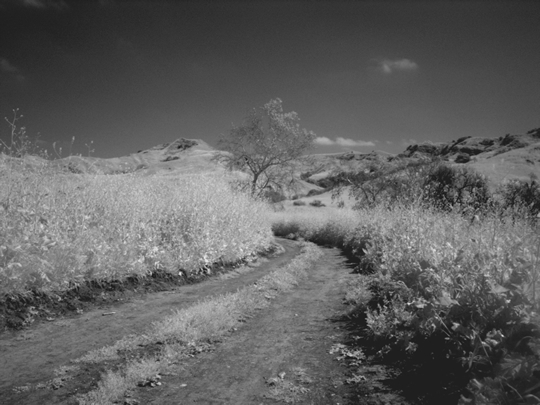 This could be be done in one of three ways; shoot a roll of infrared film, shoot infrared digitally with various filters or create a infrared image in Photoshop. We opted not to shoot a roll of infrared film for a couple of reasons. 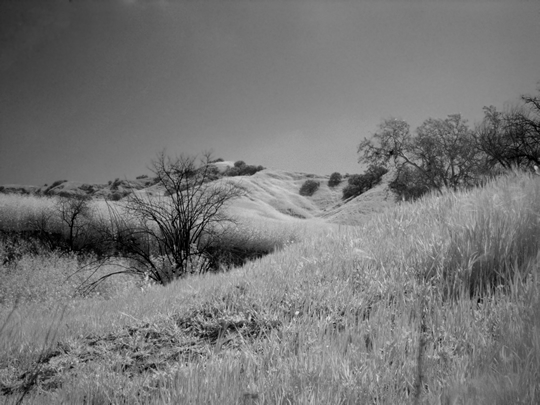 One reason is that Bryan’s Canon A2E will not shoot infrared (more on that later). My old Pentax camera did have the ability to shoot infrared film however if you know anything about IR film you know that it is very sensitive. You have to load the film in the camera in complete darkness. Doing anything in complete darkness is not a skill I have, except for loading film onto a spool for development. I also played around in GIMP trying to create a IR image out of a regular color image, while the results were passable they just weren’t infraredy enough. I know infraredy is not a word neither was ginormous a few years ago. We chose to do the assignment digitally however our Mark II doesn’t have the ability to shoot infrared. The majority of Canon SLR’s can not because of a low pass filter that Canon installs in their camera’s to get sharper images. Canon Film SLR camera use an infrared light to see the notches in the film so it would fog infrared film. During the class lecture on infrared Lanoue mentioned that the Canon G9 had the capability to shoot in IR. This was great since my coworker happened to have a G9 that he let us borrow. We had to by an infrared filter for it but that was much less than if we would have had to buy the G9. 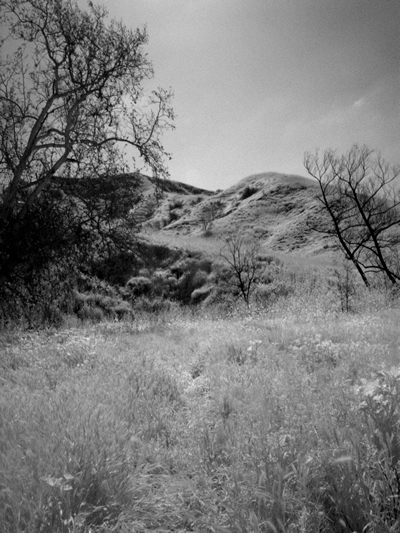 Since infrared works best on foliage we decided to go to Chino Hills State Park. The wildflowers have just started to bloom like crazy over there so it was perfect. When taking an IR shot the camera must be on a tripod because of the long shutter speeds needed to capture the image. Most of our images were at F8 with a shutter speed between 1-4 seconds. If you take IR images digitally the look red when you see them in your cameras preview. You have to take the files into a photo editing program (we used GIMP) and desaturated it. Plus you usually have to mess with the contrast a little bit to get the image just right. The other thing we had to correct for is the noise level in the photos. We found that the G9 doesn’t have great long shutter speed noise performance even at ISO 80-100 which is what we took these shots in. Below are the images Bryan and I shot for our assignment.